Not all tooth erosion is caused by decay. Dental abractions are a type of tooth erosion caused by the stress and force from teeth grinding or malocclusion. These forces can cause notches to form near the gum line, increasing the risk of tooth decay and impacting the appearance of the smile. General dentistry treatments can help detect dental abfractions and stop further damage from occurring. To find out if treatment for dental abfractions is right for you, schedule a consultation at our New York, NY practice, Harlem Center for Aesthetic Dentistry. 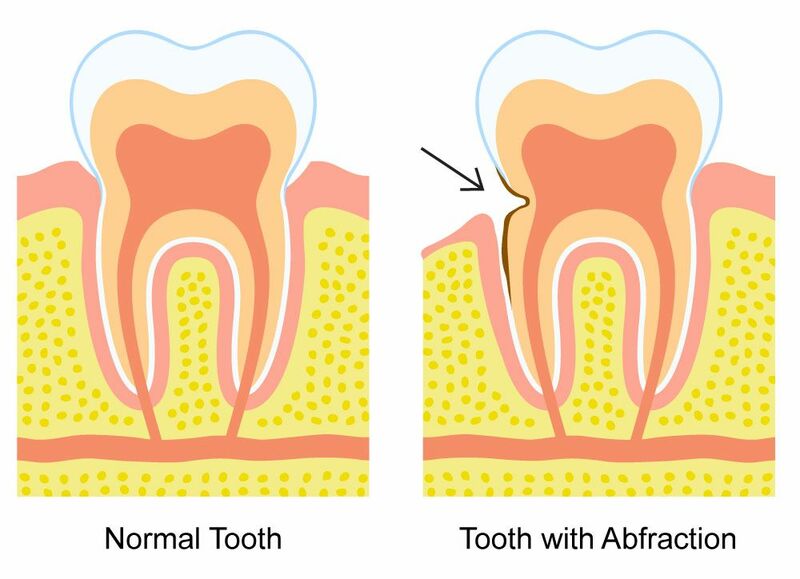 Dental abfractions are notches that form in the surface of the teeth near the gum line. These notches are a type of tooth erosion, but unlike tooth decay or enamel erosion, dental abfractions are not caused by acid or bacteria. Instead, dental abfractions are caused by abnormal mechanical forces on the teeth. These mechanical forces are often caused by teeth grinding, clenching, or malocclusion. When the teeth are regularly exposed to such forces, lesions or notches may form within the tooth's surface near the gum line. It is believed the lesions, or dental abfractions, develop near the gum line because this area is vulnerable to damage; it is where the outer enamel layer of the teeth joins the cementum layer. Dental abfractions are caused by physical forces on the teeth. Generally, the pressure and forces applied to the teeth from a healthy bite won't lead to dental abfractions. Rather, it's abnormal, excessive forces that may lead to abfraction lesions developing. Abnormal forces may come from untreated, long term teeth grinding or clenching. Malocclusion, or a “bad bite,” may also cause dental abfractions to form due to uneven biting forces. If left untreated, dental abfractions can lead to serious oral health problems. Dental abfractions interrupt the protective enamel layer of the teeth, increasing the risk of tooth decay as well as impacting the smile's beauty. When tooth decay develops within dental abfraction lesions, it can quickly progress, leading to root canal infections and eventually tooth loss. Teeth grinding treatment: Teeth grinding may be treated by wearing a custom-made nocturnal bite guard or splint. Teeth grinding treatment can protect the teeth from further development of dental abfractions, as well as prevent dental damage caused by chronic teeth grinding. Those who suffer from chronic teeth clenching may also benefit from teeth grinding treatment. Orthodontics for bite correction: Those who have developed dental abfractions caused by malocclusion may benefit from orthodontic treatment. Orthodontic treatment is effective at repositioning the teeth, helping to correct and balance misaligned bites. Tooth-colored fillings: Dental abfractions may be directly treated with tooth-colored fillings and can be used to and the restore lost portions of a damaged tooth. Tooth-colored fillings are customized to match the surrounding teeth, providing a seamless finish. To find out if treatment for dental abfractions is right for you, or to learn more about your other treatment options, we encourage you to schedule a consultation at the Harlem Center for Aesthetic Dentistry.